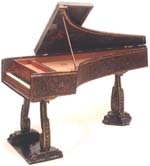 Why choose a Neapolitan harpsichord as a model on which to base some new instruments? 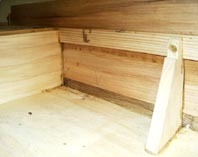 Grant O’Brien and Graziano Bandini have built two integral (cassa falsa levatoia) and two separate inner-outer (cassa levatoia) instruments along the lines of the information given above. All of these instruments have now been sold. The work on these instruments was done in the workshops of Graziano Bandini in Castel San Pietro Terme and in Sasso Morelli both of which are near Bologna in Italy.